More than a fourth (26.8%) of hospitals honored by Hospitals & Health Networks as 2013 Most Wired winners deploy one or more software solutions from HealthLine Systems. 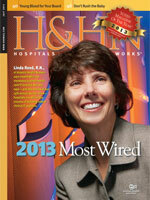 We congratulate our clients who have been honored as 2013 Most Wired hospitals. Our software solutions help clients improve access to care, move toward paperless credentialing, track patient safety incidents, and document improvements in quality. This year commemorates Hospitals & Health Networks (H&HNs) 15th annual Most Wired Survey. Healthcare’s Most Wired Survey began in 1999 as a national inventory on hospital use of information technology to improve operations and patient care. The survey recognizes hospitals and health systems for excellence in Information Technology. For 2013, 659 hospitals and systems completed the survey, representing 1,713 hospitals — roughly 30 percent of all U.S. Hospitals. The results indicate that U.S. hospitals have made big strides in laying the foundation for robust clinical information systems. Why do leading hospitals choose HealthLine Systems’ software? HealthLine Systems’ (HealthLine) specialized software packages and related consulting services enable health networks and managed care organizations to tackle their specific challenges in the areas of physician and provider credentialing, quality improvement, and streamlined access through a contact center communication hub. HealthLine clients include more than one thousand distinguished healthcare organizations in all 50 states, Canada, and Mexico. Serving clients since 1985, HealthLine has demonstrated the ability to anticipate industry challenges and to deliver superior technologies to address them. EchoCredentialing is a Web-based credentialing and provider management software is field tested by an NCQA-certified Credentials Verification Organization, CredentialsOnLine. EchoAccess is healthcare's first fully Web-enabled contact center solution with a Web-browser user interface. Evidence-based clinical guideline protocols developed by world-renowned Cleveland Clinic are a proven tool for population health improvement — and are available in EchoAccess. CredentialsOnLine is an NCQA-certified credentials verification organization serving hospitals, health systems and managed care organizations nationwide. CredentialsOnLine provides centralized verification services for more than 25 different types of providers, has credentialed more than 150,000 providers, and has completed over 1.4 million electronic Primary Source Verifications. In addition to being honored as Most Wired, HealthLine clients are consistently recognized for excellence by U.S. News & World Report, Healthgrades, Truven Health, and Becker’s Hospital Review. For more information, please visit http://www.healthlinesystems.com.